The modern home improvement or interior decoration system is mostly concerned about the proper use of available space. The days of having those spacious, luxurious rooms are gone, especially if you are living in a popular location. The modern era is all about making those small rooms beautiful and aesthetically decorated. 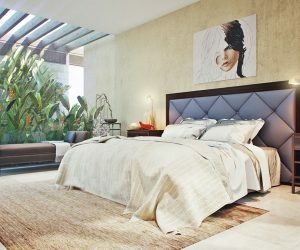 Here we shall discuss some interesting facts that can even turn a small bedroom into your dream one. This is perhaps the most important and most overlooked thing in room decoration. The first thing you must do to decorate or remodel your room is to select the right furniture. In terms of modern interior decoration “Right” means compact and smart. Furniture with useless extensions are big NO when you are trying to decorate a small room. This first step can be done simply – look for the SHAPE. The shape of the furniture is really vital when it comes to creating a good looking room. It is because all the furniture must create a symmetry to make your small bedroom look beautiful and if any of them are out of proportion, then the whole setting will be ruined. This is what will you see in most of the “feel good” Hollywood movies when it comes to art decoration of a room. A good observation will make it clear that all the furniture used is the result of a thought out plan. This century is the century of multi-tasking. Humans, phones, everything is considered to be the best when it can serve multiple purposes. The same goes for the furniture. You must have seen those beds that have space for keeping clothes, wall mirrors with wardrobes? All such stuffs are quite useful to decorate a small room. The best part about such creative choices, is it makes your purpose served without taking any extra space. If you make a good choice, then it will also look quite smart and will give you more space to use. Your small bedroom will always have some more to provide. This is the chapter where most of the time will be spent and plenty of arguments will be had. Color is undoubtedly a sensitive issue while creating your desired room. A small room will always look quite stuffy, if you use dark shades. On the other hand lighter shades will make it look pleasant. Now adjusting all that furniture, doors, windows and curtains as well as considering their colors is quite a tough task and it requires some study and expert advice to move on. Use of Aerial Space: Proper use of aerial space can make your room decoration look innovative. A hanging lamp or a show piece can really do the trick for you. Back of The Door: It is a very good place to hang towels or your daily used clothes, so use it as a hanger space. Wall Racks and Desks: These are a highly used and useful concept in the decoration of a small bedroom. It saves space and a good design makes the room look captivating. Box Windows: Make your windows in the outward side of your room and that will leave some space. In that box you can put some good looking flower vases or show piece to keep it simple yet decorative. Box Shelves On Walls: Using the higher areas of the walls with shelves is a very creative and smart idea. This will help you to create some more space to keep your things and will also give some dimensions to your room. Last, but not the least; the Bed is always the prime attraction or the attention receiver of a bedroom. The wrong decisions in bedroom decoration are mostly concerned with the choice of bed. In a small bedroom, naturally the bed gets most of the floor area and as we have discussed that using the space under the bed is a good idea and you can also use the wall behind the bed to create more space. Still, ideas like bunk beds and folding rollaway beds are also not bad in terms of utilizing space. Creative futons are also a very trendy subject in terms of smart beds. The simple fact that you must consider while attempting such choices are- they must not look ugly, cheap and must not create the reflection that you are ready to live in whatever way possible. Beds are always considered an elegant thing and our subconscious always relates a bed with the person who sleeps on it. This is why the selection of the bed must be done in a sensitive and artistic mindset. I worked for a company called Apex Construction in the North West. I decided to write a blog (my son's idea) on home improvement because it's really not hard, and very rewarding. Thanks for visiting!